At the 97th annual meeting of the Japanese Society of Animal Reproduction (JSAR), held in Higashi-Hiroshima, Hiroshima, JAPAN in September, the 2004 JSAR awards were presented to each winner. 2004 JSAR Awardees. From left, Hitoshi Ushijima, Takashi Miyano, Eimei Sato (JSAR Chief Drector) and Kyoji Yamada. The JSAR Outstanding Research Award is given for outstanding basic and applied research in animal reproduction. The JSAR Award Committee has selected the following two members as the winners in 2004: Takashi Miyano (Laboratory of Reproductive Biology and Biotechnology, Faculty of Agriculture, Kobe University) for "In Vitro Growth of Mammalian Oocytes", and Keiko Shimizu (Department of Cellular and Molecular Biology, Primate Research Institute, Kyoto University) for "Studies on Reproductive Endocrinology in Non-Human Primates". Laboratory of Reproductive Biology and Biotechnology, Faculty of Agriculture, Kobe University, accepts the 2004 JSAR Outstanding Research Award. Department of Cellular and Molecular Biology, Primate Research Institute, Kyoto University, accepts the 2004 JSAR Outstanding Research Award. The JSAR Innovative Technology Award is given for the research which contributed to a development of innovative technology in animal reproduction. The JSAR Award Committee has selected the following two members as the winners in 2004: Hitoshi Ushijima (Chiba Prefectural Animal Experimental Station) for "Studies on Application of Developmental Engineering to Livestock ProductionÓ", and Kyoji Yamada (Shibetsu Veterinary Clinical Center, Nemuro District NOSAI) for "Development of Ovulation Synchronization and Fixed Time Artificial Insemination in Dairy Cows". 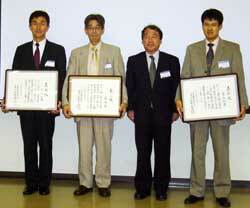 Chiba Prefectural Animal Experimental Station, accepts the 2004 JSAR Innovative Technology Award. Shibetsu Veterinary Clinical Center, Nemuro District NOSAI, accepts the 2004 JSAR Innovative Technology Award. The JSAR Outstanding Presentation Award was newly established in 2003, and is given for outstanding presentation at the annual fall meeting of JSAR. Chair of the 97th annual meeting of JSAR selected the following three members as the winners in 2004: Tomohiro Yonezawa (Department of Veterinary Physiology, Veterinary Medical Science, The University of Tokyo) for "Changes in Pulsatile Pattern of Growth Hormone Secretion during Estrous Cycle in Shiba Goats", Fuko Matsuda-Minehata (Laboratory of Animal Breeding, Graduate School of Agricultural and Life Sciences, The University of Tokyo) for "Expression of Anti-Apoptotic Factor (cFLIP) in Granulosa Cells of Porcine Ovarian Follicles", and Masami Shibaya (Laboratory of Reproductive Endocrinology, Faculty of Agriculture, Okayama University) for "Influence of the Cell Shape and Cell-to-Cell Contact in Oxytocin Secretion by Cultured Bovine Luteal Cells". Department of Veterinary Physiology, Veterinary Medical Science, The University of Tokyo, accepts the 2004 JSAR Outstanding Presentation Award. Laboratory of Animal Breeding, Graduate School of Agricultural and Life Sciences, The University of Tokyo, accepts the 2004 JSAR Outstanding Presentation Award. Laboratory of Reproductive Endocrinology, Faculty of Agriculture, Okayama University, accepts the 2004 JSAR Outstanding Presentation Award.